In the U.S., a felony is a crime punishable by a term of at least one year in a state or federal prison. A felony can also be punishable by death. Also referred to as "high crime," a felony is significantly different from a misdemeanor, which is punishable by short-term imprisonment in a local or county jail or by the imposition of a fine. There are different degrees of felonies, each corresponding to the seriousness of the crime committed. First degree corresponds to the most serious and egregious crimes including murder, aggravated robbery and assault, and drug cases where a large amount of money is involved. The punishments for these crimes range between 5 and 99 years, up to life in prison. Second degree felonies are the next step down in intensity of crime including less aggravated robbery, assault, and sexual crimes and result in 2-to-20 years in prison depending on the case. Third degree felony convictions can result in sentences ranging from between 2 and 20 years of prison time, with these sentences being assigned for multiple-offenses of driving while under the influence of alcohol or other drugs, family violence, and lower level drug charges. Additionally, each of these rankings can be intensified in degree based on prior convictions and arrests. For instance, if a current charge for a crime committed is third degree, but the sentenced individual has a record of prior convictions, the charge can be augmented from third to a second degree felony at the discretion of the judge hearing the case. 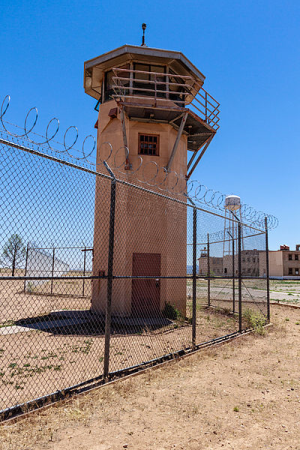 "Penitentiary of New Mexico - Guard Tower, June 8, 2012" by Ken Piorkowski is licensed under CC BY-SA. N.d. The People's Law Dictionary: felony. http://dictionary.law.com/Default.aspx?selected=740, accessed November 3, 2014. 2010 What is the difference between Felony 1, 2, amd [sic] 3. Attorney Answers. Avvo. http://www.avvo.com/legal-answers/what-is-the-difference-between-felony-..., accessed April 15, 2015.